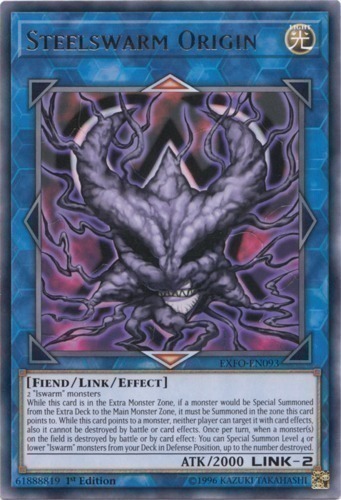 While this card is in the Extra Monster Zone, if a monster would be Special Summoned from the Extra Deck to the Main Monster Zone, it must be Summoned in the zone this card points to. While this card points to a monster, neither player can target it with card effects, also it cannot be destroyed by battle or card effects. Once per turn, when a monster(s) on the field is destroyed by battle or by card effect: You can Special Summon Level 4 or lower "lswarm" monsters from your Deck in Defense Position, up to the number destroyed.